This light and airy cowl is perfect for spring! 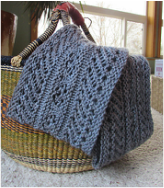 In this class you will learn a new cast on, knitting in the round and a stretchy bind off. This will be a fun spring shawlette. Using our new “Tangier” yarn from Cascade you'll see the striping colors blossom through the loose knit garter stitch and we'll learn how to knit a cute picot edge on one side as we go. You'll enjoy the soft cotton and silk feel over a tank top or sundress this spring. The perfect addition to any babies spring wardrobe! Great for a girl or boy. This little vest will teach you a lot in a small project, great for expanding your skills. 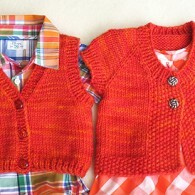 Learn all the basics of knitting. This is the class for you if you’ve never picked up a pair of needles or if it’s been way too long since you’ve tried. You will learn to cast-on, knit, purl, increase, decrease and cast-off. Let us guide you on your journey into fun with all kinds of project ideas & different fibers. *If this class is full make sure to add your name to the list for the next class. Ages 8 and up welcome. Show your true colors! 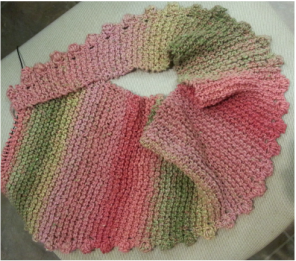 Choose the Mad Hatter Color Pack that suits your fancy and make this beautiful shawl. It is knit from the top center neck edge outward, changing colors as you go. You will learn how to read a chart for this shawl, and a provisional cast on. Learn the basic stitches of crochet like chain, single/double/triple crochet stitches plus much more. Upon completion of this class you’ll be ready for great things such as home décor items, scarves, sweaters and baby things. Ages 8 and up. Add a little sparkle to your spring! Lace can be easy, let me show you how. Once you get started, you just have one pattern row to repeat that is easily memorized. This is so easy you just might make more than one! 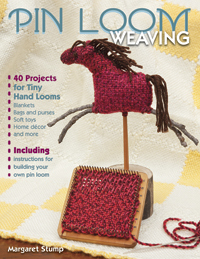 A pin loom is a tiny loom with tremendous possibilities. The Zoom Loom is easy to take with you-- weave anywhere, any time. Experiment with an idea and see the result in less than fifteen minutes. And they're FUN! Class #1 introduces the Loom and gives you an opportunity to build your pin loom weaving skills while creating a Winter White Loom Bloom. Class #2 allows each weaver to explore a number of project choices including cell phone case, water bottle holder or soft bowl while teaching joining and finishing techniques.